Forget the stress and mess … birthday parties at the Virginia Discovery Museum are as easy as 1-2-3! 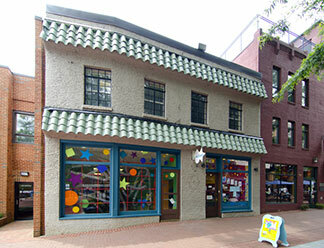 The Museum's open galleries, bright colors, and interactive exhibits provide a safe and playful atmosphere for your child's big day, and our great location on Charlottesville's Downtown Mall offers proximity to several food and catering options, as well as local shops to help you find a gift that’s just right. With packages starting at $175 and both weekend and after-hours time slots available, discover why VDM is your perfect party spot! Questions? Visit the Rules & FAQS page, call (434) 977-1025 x106, or email parties@vadm.org. The Museum offers 4 base party types to help you create your perfect party package: our Classic Parties for all ages, our Pint-Sized Picassos and STEM parties for ages 2-7+, and our after-hours Night at the Museum parties for ages 7+. *StarLab: After-Hours and Sundays only. Night at the Museum: After-Hours on Fridays and Saturdays only. The Museum offers 3 add-on options: Additional Children, Goody Bags, and Additional Time. Some add-ons are only available for certain party types or days as noted below. To book your Birthday Party, call the Museum at (434) 977-1025 x106. Can’t find the answer you’re looking for? Give us a call at (434) 977-1025 x106 or email parties@vadm.org. VDM occasionally uses photographs from exhibits and programs for educational and promotional purposes. With admission to the Museum or participation in a VDM program, you grant permission for photographs of you and your dependents to be used for those purposes. Names will not be published. If you do not consent and wish to opt out of this policy, please inquire at the front desk or call (434) 977-1025.